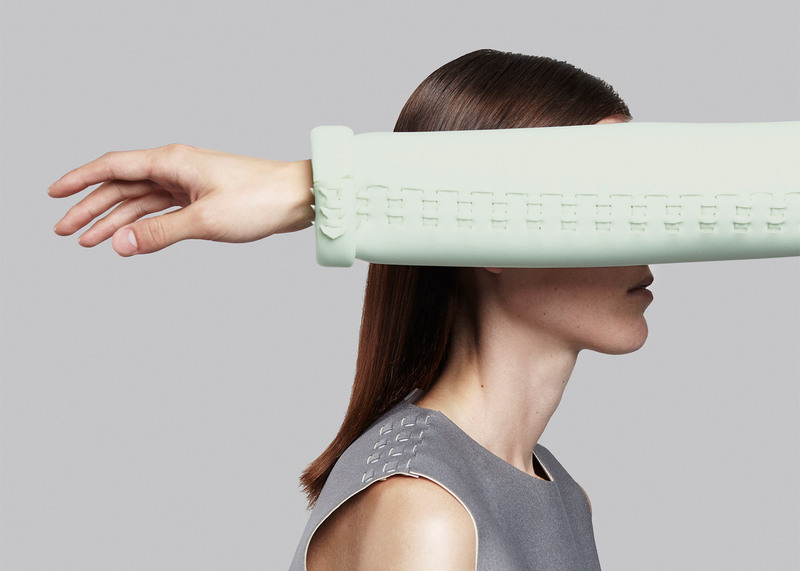 Dutch Design Week 2015: Dutch designer Martijn van Strien has launched a fashion company that allows consumers to download, customise, produce and self-assemble clothing designs. The Post-Couture Collective site launched with six pieces taken from the One Off collection by van Strien's own experimental fashion label mphvs. Each of the items can be personalised to the buyer's individual measurements, and then either downloaded and further customised before being produced at a local Makerspace, or delivered as a kit. "I was inspired by the challenge I saw in trying to develop a collection that would be completely makable in Makerspaces," said the designer, who launched his mphvs label with a range of laser-cut unisex garments. "Aesthetically I'm always inspired by architecture, the austerity of Brutalist buildings or the construction techniques that you find in bridges for example," he added. Brutalist architecture also inspired the designer's collection of tarpaulin outwear, launched at Dutch Design Week 2013. Each of the pieces that make up the One Off range of garments can be shaped with a laser cutter, and feature seams that neatly slot into one another – removing the need for sewing machines. "Post-couture garments are designed on the spot by our software whenever someone wants to buy one, and thus also produced only when they're sold," said van Strien. "This means that the 30 to 40 per cent of all the garments that arrive at a shop and that currently get thrown away at the end of each season will be a thing of the past." The clothes are designed to be constructed from Spacer Fabric – a 3D-knitted material similar to neoprene and made from recycled PET bottles. Costing between €40 and €130 (£30 to £96), the pieces are available in green, grey-white or grey-black, with the fabric taking its colour from the original hues of the recycled plastic. According to van Strien, the material can even be recycled again after wearing. "We hope that by producing locally, from local materials, and using designs that are shared digitally we can eliminate a lot of the transport involved in the garment industry," the designer said. "I hope, and think, that by offering people a chance to influence and be part of the design and production process of their garments will create much more attractive products then the current mass-manufacturing industry does." "Who wouldn't choose a garment that is designed and made especially for them and their body shape over something standard that everybody else has as well," he added. Although currently just clothes by van Strien are available, the company intends to collaborate with international designers to add to its range of customisable garments. Post-Couture Collective will be presenting designs at concept store You Are Here in Eindhoven, as part of Dutch Design Week, which takes place from 17 to 25 October 2015. "Expect a futuristic store with virtual fitting opportunities, intelligent systems to automatically change designs to your body measurements and a laser cutter to produce garments while you wait," van Strien elaborated. Earlier this year, Ben Alun-Jones, founder of Knyttan – which allows customers to create bespoke knitwear via a web app – told Dezeen he believed mass customisation would transform the role of designers. German sportswear brand Adidas has also made steps towards customisable products, with a pair of concept 3D-printed soles that could be tailored to the individual contours of the wearer's feet.